One of the many stories that Indians refuse to believe is the one of the chili and its origins. Its unfathomable as a layman to believe that Chilies are not Indian and are less than 300 years old! Well, true story and here it goes... India being their trading partner, the Europeans had used black pepper as a medicinal aid and to spice up their cooking since Greek and Roman times. By the Middle Ages, black pepper had become a luxury item, sold by the corn and used to pay taxes. Traders looked for new ways to India and the lands beyond — not just for pepper but for other lucrative spices, and for silks and opium. Columbus did not find India and black pepper, but he found a fiery pod that would, within years, not only infuse Southern European cooking with bold new flavors but also revolutionize cooking in India. The remarkable spread of the chili is a glorious chapter in the story of globalization. Few other foods have been taken up by so many people in so many places so quickly. 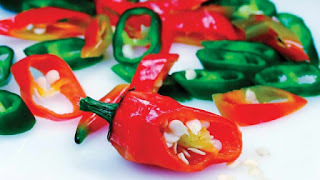 Chilies belong to the genus Capsicum, family that includes tomatoes, potatoes and eggplants. Only five of Capsicum's 25 species have been cultivated, and in South America, where most of the world's wild chilies are still found. The Europeans didn't immediately fall for the chili, they did become its greatest propagator. Portuguese traders carried it to settlements and nascent colonies in West Africa, in India and around East Asia.